Right place, right time, right guy, right philosophy: Chip Chase’s White Grass Ski Touring Center and Cafe has hit its stride. It’s fair to guess that a lot of Tucker Countians show a distinctive flair on the cross country trail. “I learned to ski from Chip Chase,” says local resident Susan Haywood. “Trying to keep up with him on these night skis—we call them ‘Chippy Carefree Adventure Tours.’” Chase is a compact man, and he bushwhacks, going under brush, and he’s fast. “He’s got a special ability and a unique style. He hops up and down a lot and he’s real animated, like, quick-footed, always going through the trees like a chipmunk.” There’s often a little moonshine involved in these night tours, which Haywood says can steady the nerves or lend courage—though beginners might not sip quite as much as Chase. “I think a lot of people have learned to ski this way,” Haywood says. But during ski season, if Chase isn’t skiing at White Grass, he’s greeting skiers. Tucker County can’t be fully appreciated independent of the exuberance of Chip Chase. “He makes this place what it is,” says local entrepreneur Ryan Gaujot, who met Chase at White Grass’s annual Jack Frost season kick-off party in 1999. “He sets the tone and the enthusiasm for the positive atmosphere that folks strive for here. 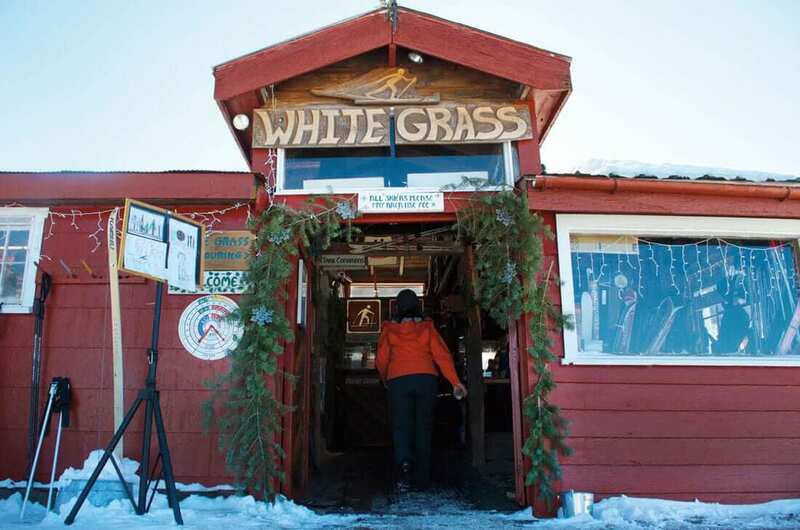 It’s all about getting outside, coming in from the cold, recharging with good food, and doing it again.” Now in its 35th season, White Grass, a quirky reflection of its owner, has become a Tucker County and West Virginia institution. Chase lived in Virginia as a young adult in the late ’70s. He’d grown up skiing all over and had learned cross country in Vermont a couple years earlier. “I felt I could help spread the Nordic dream,” he says—meaning cross country skiing, as opposed to Alpine, or downhill. Chase and a friend, Winslow Ayer, set up trails on Shenandoah Mountain not far from Harrisonburg, Virginia, for the winter of 1979-80. “We were back-to-the-landers, not from the country as kids but fascinated by the fact that you could grow all your own food and your own orchards,” he recalls. “The ski trails augmented income that we had at other seasonal work. We set it up near a place called White Grass Knob, so I named it White Grass. We thought it was a neat little double entendre—lots of people think it means snow. 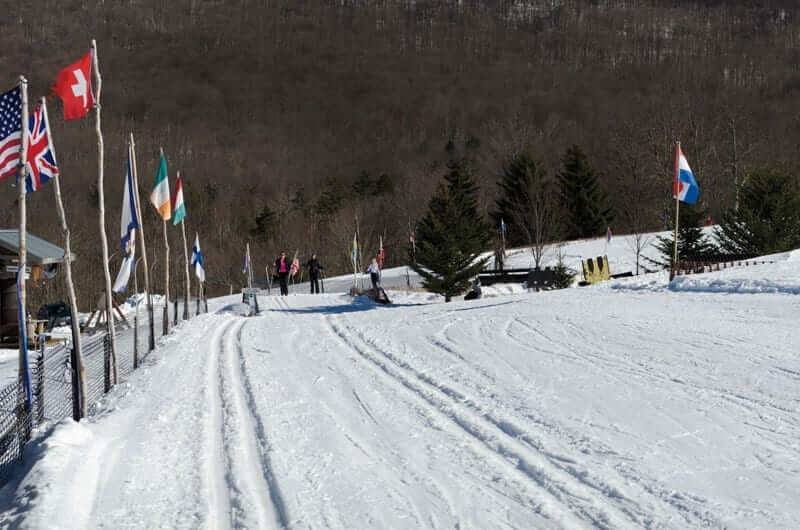 That Virginia ski season proved too short for their liking, so Chase and Ayer checked out Canaan Valley in West Virginia—the highest valley east of the Mississippi. They leased the former Weiss Knob downhill resort area on a farm that lay up against Cabin Mountain on the valley’s east side, and they opened White Grass Ski Touring Center in December 1981. In plain ski resort terms, Canaan Valley gets more than 13 feet of snow a year, among the very highest snow totals south of New England. White Grass has about 40 miles of trails, around half of that groomed, with a dozen warming huts. And for Nords who like serious terrain, White Grass isn’t so different from the two downhill resorts it lies between, with more than 1,200 feet of rise from 3,220 feet of elevation, some of it above the treeline with wide views of the valley. It’s a conscious and energetic cultivation of goodwill that ripples out into the community. It’s a big deal for a family with two young ones to be able to drop in at a resort with no equipment and ski the day for $100. That’s part of White Grass’s good-natured business model: Stay true to the fun, and give people really good value. Jack Frost celebrations have been known to drift well into the next day. Morgantown resident and longtime White Grass skier Adam Polinski remembers hanging around a crackling bonfire some time past midnight with a few dozen others after Jack Frost one year. He was just starting to think about his sleeping bag when Chase suggested a hike a few hundred feet up Weiss Knob Slope to the old lift shack, which everyone decided to join. They all enjoyed the view from 3,600 feet. “Then Chip pointed out that we were around halfway up to Round Top, and how great would it be if we just all walked on up there?” Polinski remembers. That’s at 4,000 feet. In they end, instigated by Chase, the group hiked up for the view of the stars and valley from Bald Knob, at 4,300 feet. After the long walk back down, Chase led a 4 a.m. raid on the refrigerator at White Grass Cafe. “Even though White Grass is his business, he still made it seem mischievous and hilarious that we were raiding the fridge, as if it were someone else’s and we were getting away with it,” Polinski laughs. Through the season, skiing itself is daily fun. And then there are races. “We have these hash hound events where people chase around and some of them have a head start, not super-competitive,” Chase says. There are Special Olympics and a 25-kilometer ski marathon. “People come from North Carolina, some from Pennsylvania, Maryland, Virginia for that,” he says. A Groundhog Day ski seeks clues to the rest of winter, and each month ends night-skiers marveling under the full moon. Fun usually involves food, and White Grass Cafe’s reputation for gourmet, vegetarian-friendly fare sometimes lines skiers up out the door. “When you’re out skiing and it’s really cold and then there’s hot food, it tastes better than ever,” jokes Little, who runs the cafe. “But people do love it, because we make everything pretty much from scratch.” The daily lunch menu includes four or five soups, several paninis, and a nacho platter with White Grass’s vegetarian chili that’s said to rival any meat-based version. “We also make our own salad dressings, and in recent years we’ve been able to get local, fresh greens in winter,” she says. Friday and Saturday night dinners feature an ever-changing menu of appetizers and entrees. “We have a lot of good cooks, and we let people create. That’s probably what makes it so good,” Little says. In the 2016-17 season, the cafe will sell its fresh hummus, salsa, and some soups to go for the first time. And in summers, it offers catering. And all of that fun—skiing, learning, eating, and toe-tapping—goes farther if people can afford to join in. “We stay super affordable, maybe to kind of rub it in the nose of the Alpine industry,” Chase says. “Not around here, but internationally, it’s super expensive, and we wanted to be super cheap.” Day-use at White Grass is the best bargain around, at $20 for adults and $5 for kids under 12. Rentals and season passes are similarly reasonable. The best deal of all is a “free trade” program for kids: Buy one pair of skis for $250 and trade up for free every year, then pay no more than $150 to get into an adult pair. Cross country skiing changes one’s life, in Chase’s view. “When people say, ‘We’ve got some bad weather coming in, you say, ‘You mean good weather?’ All your favorite places are transformed into this magic winter kingdom—your farm, where you hunt. It’s ethereal. It might be for just a week, a weekend, a day, but it’s aesthetic and spiritual, an inward thing. It can just be one ski that’s so special the way the snowflakes fell on your sleeve, the ice, the cracking of the woods, the way the wind sounded. It’s a memory.